A'Sean's Tuesday night show at Uptown Arts Bar was organized in celebration of his upcoming album, "A Love Blemish." Just as he did at his recent outing at The Granada, A'Sean showcased his versatility, performing supercharged party tracks like "Black Men Don't Cheat" and more somber ones like "Mirrors." These more emotional tracks often painted vivid pictures of his family's hardships and his own health problems from childhood, leaving his mother, who was seated near the stage, wiping away tears on more than one occasion. 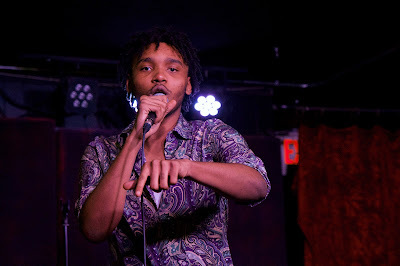 Near the end of the show, however, A'Sean announced that there had been enough sadness for the evening and jumped into performances several freestyles and his 2017 single "i." If the reaction A'Sean got from his friends, family, and fans on Tuesday night is any indication, "A Love Blemish" might just be a smash.